Gaspar: Was there anyone else there? Skakel: There might be. I can't see who it is. Gaspar: What else are you doing? Anything else? Gaspar: What time do you leave there? Gaspar: Okay, you're leaving now. You're getting in the car. Who's driving? Can you see? Skakel: I think I'm driving. Gaspar: Who is in the car with you? Skakel: Rush. Maybe someone else too, but I can only see Rush. Gaspar: Okay. You get home. About what time would you say it is? Skakel: A little after eleven. Gaspar: Go inside. Is there anyone there? Is there anyone up, John? Gaspar: Who is in the kitchen? Skakel: I don't see... getting something out of the fridge. Rush goes to bed. 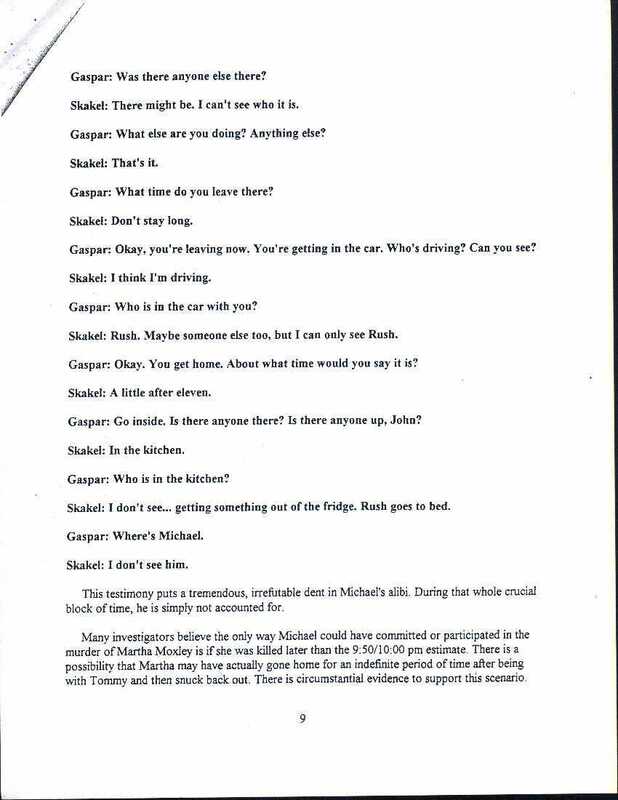 This testimony puts a tremendous, irrefutable dent in Michael's alibi. During that whole crucial block of time, he is simply not accounted for. Many investigators believe the only way Michael could have committed or participated in the murder of Martha Moxley is if she was killed later than the 9:50/10:00 pm estimate. There is a possibility that Martha may have actually gone home for an indefinite period of time after being with Tommy and then snuck back out. There is circumstantial evidence to support this scenario.